Trained advisors waiting to take your call. Car Batteries by Make & Model. Car Batteries by Part number. A family run business with a wealth of knowledge and expertise. 12V Expedition 105AH AGM Caravan Leisure Battery UItra Deep Cycle. 12V Xplorer 110AH AGM Caravan Leisure Battery UItra Deep Cycle. Made in Europe and Exclusive to Alpha Batteries. Meets European EN 50342 Standards. Designed for a wide range of purposes, for long-term discharge applications and engine starts too. Batteries are produced in an up-to-date technology AGM (Absorbent Glass Mat) and instead of having liquid acid consist of the electrolyte, which is kept inside the special glass mat. The AGM batteries are therefore 100% leakage and spill proof. Absolutely leakage and spill proof. High cyclic performance and durability. Longer life of a battery. Resistance to high and low temperatures. Caravans, Motorhomes and other leisure purposes. Low height 190mm box for easy fitment. For the heaviest duty applications, you can't go far wrong with an AGM battery. Take it from us as specialists, AGM batteries do more recharge cycles than standard lead acid and it's a fact. Up to four times the lifespan of standard wet lead acid batteries. Great for engine starts too. If you use a lot of power out of your batteries then AGM batteries recover better and hold their charge longer. Great for motor mover use and extreme off hookup leisure conditions. Dimensions: 345 mm Long x 175mm Wide x 190 mm Tall (INC POSTS). Fully charged and ready to fit. It is the customers responsibility to check the dimensions, terminal layout and type before ordering. Please carefully check your existing battery or tray to ensure compatibility. All batteries arrive fully charged and ready to fit and are packed securely. Delays can occur from time to time with factors beyond our control. Our dedicated tracking team will try to resolve any issues that may arise. Some Scottish Highlands and Northern Ireland postcodes will incur a deliver surcharge (see below). As eBays longest online running battery company we pride ourselves on customer service and dedication in getting the battery to you as soon as possible. Leaving a telephone number makes it much easier to sort any deliver problem out. The Following Postcodes carry a surcharge KA, KY, AB, IV, PH, PA, HS. We do not deliver to Isle of Mann or Ireland. We can however deliver pallets. Please note all batteries tested locally must be fully charged. Deal Pair 2 x 12V Ultra Plus 220AH Leisu.. SEALED CALCIUM 12V XPLORER 190 AH LEISUR.. 12V 200W Xplorer German Cell Solar Panel.. 12V 150W Xplorer German Cell Solar Panel..
12V Ultra Plus 220AH Leisure battery. 12v Xplorer 220AH Sealed Deep Cycle Leis..
6 Volt Leoch (TROJAN) T145 260 AH Tracti.. Get in touch with us. 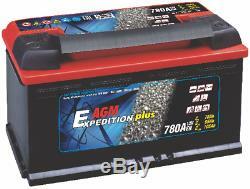 The item "12V Expedition 105AH AGM Caravan Leisure Battery Deep Cycle. 5 Year GTEE" is in sale since Tuesday, November 20, 2018. This item is in the category "Vehicle Parts & Accessories\Motorhome Parts & Accessories\Caravan Parts\Mobile/ Touring Caravan Parts". The seller is "alpha-batteries" and is located in Rochdale, Lancashire. This item can be shipped to United Kingdom.